Injectables, laser techniques, and other facial treatments are designed to enhance skin texture and tone for a youthful appearance. Some treatments target tightening skin, while other methods are designed to smooth and improve skin texture. You can combine many treatments to achieve your desired results, and our medspa staff is devoted to maintaining the most current, safe technology to help you reach your goals. Many patients feel more confident and refreshed after undergoing non-surgical treatments, and most techniques require no downtime, allowing for an immediate return to daily activities. Injectable treatments can address targeted areas of the body, as shown in the American Board of Cosmetic Surgery diagram below. Hyaluronic acid fillers, such as JUVÉDERM® XC and Restylane®, can restore volume in specific regions by plumping the skin. Neurotoxins, such as BOTOX® Cosmetic, can reduce expression lines by relaxing muscles. A double chin can be addressed with KYBELLA® to reduce fat under the chin. Laser treatments are designed to rejuvenate skin and remove sun damage, age spots, and other blemishes for an improved skin surface. Laser hair removal can reduce hair from specific areas of the body. Chemical peels and microneedling can address sun damage, age spots, and minor imperfections by penetrating the skin’s surface to promote healing. Non-surgical treatments are temporary and subtle, while surgical procedures provide long-lasting effects. If you have severe signs of aging and want results that will last longer, then plastic surgery may be an excellent option for you. Our staff will examine your face during your consultation to provide a recommended treatment plan to achieve your desired outcome. 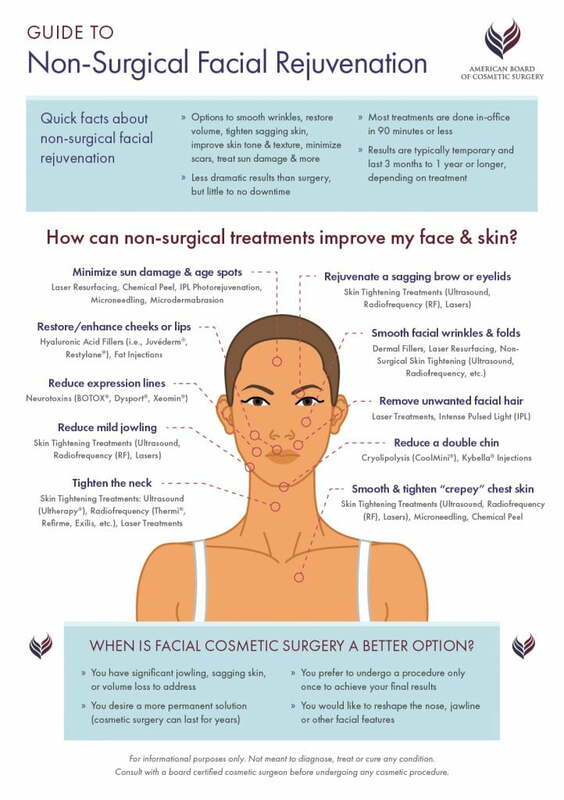 To learn more about non-surgical options for renewing your facial skin, contact our office by calling 786-802-6699.